The Transatlantica Espania freighter had space for about 40 passengers. It was going to make 6 stops as we headed across the Atlantic and the Caribbean towards my destination of Vera Cruz Mexico. 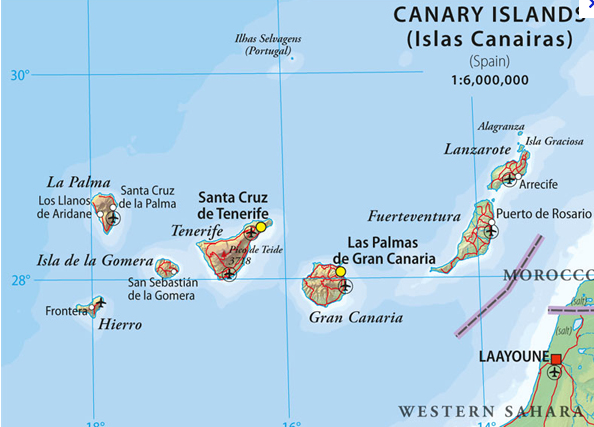 First two nights to the Canary Islands, then a long 5 day cruise out on the “high seas” out of sight of land to our first landfall in the Americas, LaGuaira, Venezuela, then up to Curacao, Puerto Rico, Santa Domingo, and my stop, Vera Cruz. The 21 day cruise cost only about $250 and that included 3 squares and all the wine we wanted. I was in steerage in a 8 bunk dormitory on the port stern, over the screws. There was another mens dorm on the starboard stern, a couple of women’s dorms and then a few small staterooms. The passengers were mainly spanish folks returning to the Americas from family visits. There was a gal my age from Santa Barbara, a couple of young men who spoke good english, and a Chinese magician. It was a lovely quiet cruise – sunshine in the days and warm nights as we passed though the Tropic of Cancer and headed in the direction of the equator. We stopped first at Arrecife in the Canaries, just off the southern Moroccan coast for a eight hour freight drop. The hills above the small port town looked inviting and I decided to hike up a long road that wound through juniper and palms and see some of the island. As I was descending after an enjoyable few hours tramp, I first saw, and then heard the steam whistle of the ship tied to the wharf about a good mile off. I started to run like crazy – no money, stuck in the island – after all this – my god “feet- do your thing”! Arms pumping, legs churning I came out of the streets and onto the long wharf. I saw the lines were being untied and the gangplank lifting – I had to give it all I had. The days on the warm deck slipped by as we crossed the Atlantic. I got sea sick and lay in the bunk wondering if I had had a relapse of malaria. One evening a couple of us sat in the starboard dorm with the Chinese magician – he opened his red wooden trunk and showed us some of his props, but wouldn’t share their secrets. He was about 60 and was going to roam the small towns of South America eking out enough to live on. Sometimes late in the evening I’d sit on the cabin roof and play my guitar, the stars shimmering. We stopped briefly in Venezuela, then the Dutch island of Curacao, on to Puerto Rico then Santa Domingo, and finally last port at Vera Cruz, Mexico. I got off, went someplace I can’t remember to pick up $25 which Dad had wired me – I had mailed a post card from someplace asking him to send me some bucks in Vera Cruz and he had come through. That allowed me to skip hitching thru the Mexican bush. I wandered around the harbor town looking for the right bus station – I caught a second class bus with chickens and babies up overnight to Tampico. Through the jungle lowlands of the Caribbean coast – put the bus on a flat barge river ferry; stopped at Poza Rica de Hildago for roast chicken from the street vendors; woke up in a stupor at Tampico; then on into the highland of Monterrey and finally 30 hours after we started was burped out onto the dark empty streets of Nuevo Laredo, where I learned not to cross Mexican borders in the middle of the night. I walked across the flat concrete bridge over the Rio Grande. There was no one around as I approached the immigration and customs sheds. It was after midnight. I guess I looked a bit suspect: bare feet in beat up sandals, faded blue long-sleeve shirt, shredding sun bleached khaki levis, longish hair, guitar in a cloth case, airplane bag with broken zipper. After getting the 3rd degree on my passport I moved to a rough looking woman customs police. She emptied the bag on the table shed. After inspecting every thing she lifted a prescription pill vial. Well, the back story was that many months before I’d spent a few weeks up all night popping “bennies” and reading Strindberg. Benzedrine was a legal non-prescription drug in Spain and I had forgotten the empty vial lying in the bottom of my bag. I responded to her “What’s this?” with that explanation. Then she held up a sibsi pipe. This is the traditional Morrocan kif pipe and made a great keepsake reminder of the many wandering afternoons in the mottled sunlit alleys and squares of the Marrakesh medina. The head of the pipe is a very small clay head and it was empty. “There’s residue in this! What is it?” I told her that I had no idea – I had bought it from someone as a souvenir. At that she said “go in there” as she pointed to the back room. As I went I watched her get out a razor and start to cut the seams in my bag. The next thing I heard was “strip Mister” – then came the “middle of the night – Laredo border – get naked and bend over full cavity search”. I wasn’t outraged but I was a bit pissed. Nevertheless I walked out 20 minutes later with a cut up bag, guitar, and a headless sipsi. Some 40 years later I still have the carved wooden stem and look forward to getting a new head. But at that point it was 1 am and I started to hitch – back in the US 14 months later. It took me 3 days to hitch from the border to Menlo Park. The first day in Texas I had the run in with the queer with the linoleum knife, as related in Part 1 of this post. I slept in freeway medians and ditches – the weather was fine. I rode in a Chevy El Camino across New Mexico- sweet. Somewhere out of Fresno I was picked up by a guy in another truck..he had taken the regular seats out and fastened to the floor upholstered arm chairs. He had a selection of different colored sun glasses for his guests – 2 incense burners and a couple of crystals that swung as the car swayed sending colored prismatic light around the cab. He worked in a furniture factory. He lit up a number and, as we passed it back and forth, I thought that the hipster culture had gone pretty mainstream if this was how cats in Fresno rode. But then I was overcome with cannabis induced paranoia again and could not speak. His last words to me as he let me out at Manteca was “Are you alright man? Are you alright?”. I curled up in my cotton sleeping bag at the intersection with Hwy.120 and slept well. It took me all day to get from Manteca to the intersection of Santa Cruz Avenue and The El Camino. A beautiful young gal picked me up and drove the mile up Santa Cruz to my parents cul de sac. I could tell she was very interested in me. She asked me where I was coming from – I don’t know what I told her. As I walked up the lane in the beautiful autumn evening I didn’t feel much. As I entered the folk’s drive my mother was at the kitchen window – it was dinner time and she was finishing up the meal for her and my father. She said to him “He’s here”. They opened the door to me and my mother reached out and hugged me. I looked over her shoulder at my smiling father. I was amazed at his visage – over all that time I had forgotten how he looked. We shook hands and I gave him a kiss. It seemed then, and still now, that I had been away from them for a long time – and really I had – for well over three years. then close to a year and a half in Europe. Our lives in these settings had no relation, at least at the superficial level, to how I was raised in the warm homey glow of the Eisenhower 50’s. My father’s boss Gen. Eichelberger’s wrote the history of their 8th Army’s battles through the Paficic and occupation of Japan. We had a common frame, a common set of values and, in retrospect, a common good fortune. Postscript: I lived at home with them for almost a year. It took months to come back to some level of normality and frankly several years to be comfortable back in “the world”, as we said in Vietnam. I went with my father to JC Penney’s buy a dark brown corduroy sport coat. This signified the new uniform. And I could now interview for a job. … On the basis of my Army experience, I was going to be offered a job as a dispatcher for a national trucking job, but I had to take an “Honesty Test”. It was a 1 hour computer multiple choice – with the same question asked 3 or 4 ways. I failed it. I guess I answered the question about what I would do if a colleague was taking pencils home from work 3 or 4 conflicting ways – the computer must have figured out I was trying to give them the answer I thought they wanted to hear. The hiring manager was stunned – he said it was the worst score the company had ever seen. But I got a better job at Stanford Research Institute that ultimately led me to Silicon Valley. So no harm except to my self-respect. Sometime in mid 1970 Mike and BC were kind enough to ask me to be their roommate. That was good, very good.